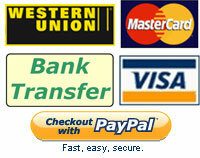 - Paypal, Credit cards (Visa, MasterCard). – 60% on order confirmation. – 40% on completion of shipping procedures and submission of shipping documents.